The photo id for this photograph is 35, in the Trains and Railway Lines album. C&HP railway lines as they cross the bottom of Bridge Street. 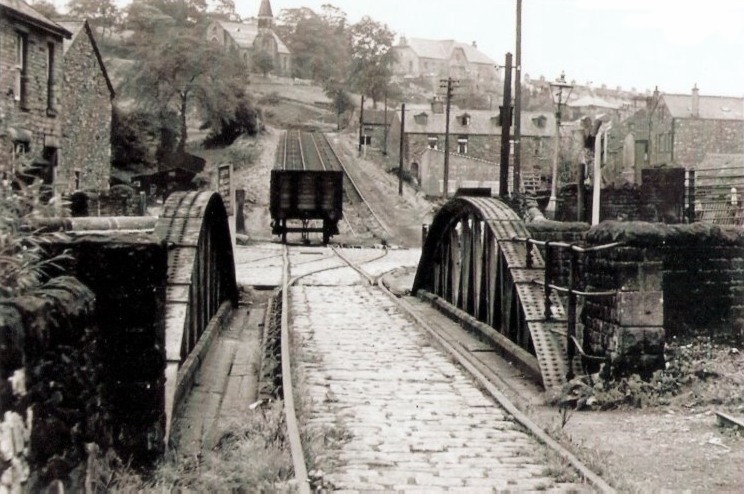 What always intrigues me about this photo (and similarly located ones) is that the branch into Goyt Mill only comes off the "up" side of the incline, so loaded coal wagons would have to be run down the incline onto the bridge then taken a few yards backwards towards the "up" incline, to clear the points , then finally be pulled by the horses into the Goyt Mill. Unless of course, this incline was effectively operated bi-directionally, so that wagons could be lowered down either line of the incline. If this was the case, then it is extremely unusual in the UK. Plus, I think most horse-gins are arranged to only be turned one way. I guess the coal came from the Manchester direction via Shallcross sidings. Does anyone know if it was all delivered by road when the incline closed? Or if anything else was supplied to the Goyt Mill or the CPA via the CHPR? I have a very good history of the CHPR, which may possibly answer Buggyite's question about the operation of the incline ... but unfortunately it's in a removal carton in storage at the moment and I can't get at it until we manage to move into our new house.